One bad moment in a book has the potential to put a sour spin on the rest of a good story. Freefall to Fly has one of those moments. 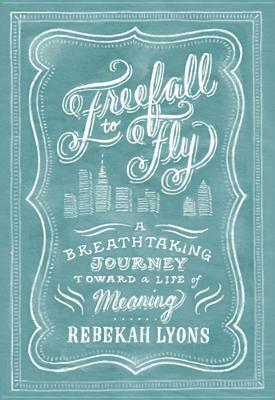 Rebekah Lyons’ tells her story of how she overcame fear and anxiety, but undercuts that story with one potentially dangerous assertion. I wanted to like this memoir–but it isn’t safe. With her husband and three kids, Lyons moves away from the comforts of living close to family and friends in the south to a completely foreign life in busy New York City. The transition is difficult and she doesn’t handle it well. She begins having panic attacks and wonders if the move had been a terrible mistake. “We are born with a large capacity for coping, especially when aided by human mechanisms. Each incident we encounter thickens our skins a little more to take the next blow. The more we medicate, the thicker the skin becomes. Before we know it, we are staring through pain and tragedy with eyes that don’t blink, tears that don’t come, skin so tough we feel nothing (136). I just don’t even know where to begin. I think she’s confusing medication for, I don’t know, perhaps depression? These blanket statements about medication are flat-out wrong. She bases these assertions about using medication to numb out on the experiences of people she knows, and especially the situation of her father who suffered from severe mental illness. PUBLIC SERVICE ANNOUNCEMENT: Anecdotes are not the same as facts. Just because some of the people you know used medication as a way to avoid dealing with the problems in their lives does mean everyone uses medication as a way to avoid dealing with problems. Just because you (the author) might use medication to numb out does not mean that everyone who takes medication for depression is numbing out. Telling readers that by taking medication for depression you are only trying to numb yourself is dangerous and wrong. Lyons is entitled to her own opinion, but the editor and publisher (Tyndale House, a Christian publisher) who let that stand in the book were irresponsible and negligent. Those with depression are struggling enough–they don’t need to be told the lie that medication isn’t necessary and that they just need to try harder to get better. Would Lyons’ (and the many others who say medication for depression is an escape) tell someone with a broken leg that they just need to try harder to heal the broken bone? Would you deprive someone of antibiotics for an infection and tell them that medication will just numb them? Absolutely not. Depression is real, and medication for depression can be exactly what someone needs to get on the path to healing. I won’t tell you not to read this book. I will tell you that if you do read this book, be discerning. Once I read her thoughts on medication and mental health, I had a very hard time taking to heart any of her other conclusions. In fact, I can barely remember anything else about the book. This book was a disappointment. It’s strange to think about a book set in 1991 as historical fiction, but it was over 20 years ago. 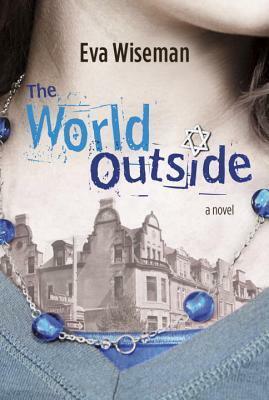 The World Outside by Eva Wiseman, with the setting of a Hasidic community in 1991 New York, definitely falls into that genre. I had high hopes for this book, but unfortunately I only gave it a 2-star rating. Teenager Chanie Altman is part of an ultra-conservative Jewish group living in New York in 1991. Everyone in the community follows their rabbi with the utmost devotion, to the point of believing he is probably the messiah. Chanie’s world is strictly controlled, but as is the case with most main characters in novels such as these, she yearns to break free from the restrictive rules. She meets a boy, of course, who encourages her to use her never-trained yet amazing singing voice and apply to Juilliard. The underlying conflict in this book is racial tension between the Hasidic community and African-Americans. Chanie and her community are offensively racist, at least Chanie is until she meets and befriends an African-American girl her age, who shows her that she shouldn’t be so prejudiced. If you can’t infer my implied eye roll at that plot point, know that I found it ridiculous. I was intrigued to learn more about this conflict, based on real-life events, but it was so simplistically and unrealistically handled that I just couldn’t take it seriously. The World Outside had a great starting point. However, thanks to lazy story-telling and poor characterization, it just fell flat. Other reviewers of this book claimed that Chanie and her group were unfairly and incorrectly portrayed. I can’t speak to that particular claim, not being an expert in Hasidic Judaism, but overall I found the portrayal of the people and their community to be far too simplistic. To top it off, I hated the ending. It came out of nowhere and didn’t fit the story or the character. The World Outside was a disappointment. When I began my new job, I started spending more time in the car driving to work. 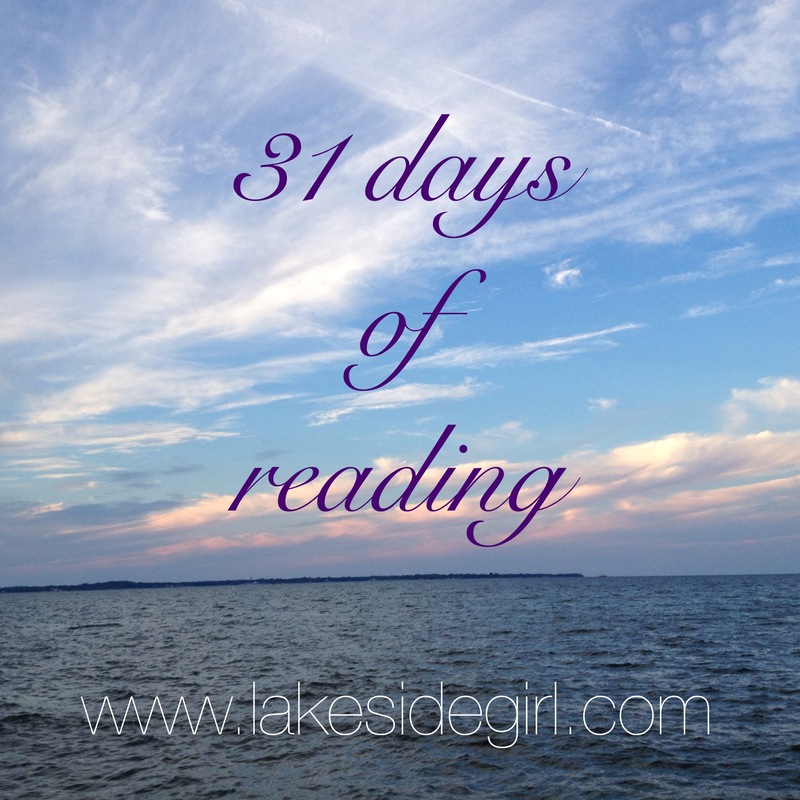 I realized I needed to maximize all possible reading time in order to have a hope of finishing my 100 books in 2014. The solution? Audiobooks. Listening to a book on CD is a very different reading experience than visually reading a printed book or e-book. I can’t flip ahead, or even get spoiled by accidentally reading further along on the page. I’m at the mercy of the pace of the narrator, but it’s a great way to challenge my brain to pay attention a little differently. 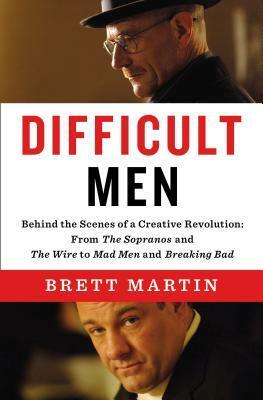 I chose Difficult Men: Behind the Scenes of a Creative Revolution: From The Sopranos and The Wire to Mad Men and Breaking Bad by Brett Martin as my first audiobook experiment because it caught my eye on the audiobook cart at the library. I was going on a drive to Arkansas the next day and I wanted to be prepared for the drive with listening material. Last year I read Alan Sepinwall’s The Revolution Was Televised: The Cops, Crooks, Slingers and Slayers Who Changed TV Drama Forever, a book on the same topic. I loved reading the stories behind such popular TV shows, even ones I had never watched (and never plan to watch, like the Sopranos) and was interested to learn more from Difficult Men. Where The Revolution Was Televised explored the background of a number of tv shows, Difficult Men focused specifically on the male creators and showrunners of tv dramas from what Martin calls the Third Golden Age of television. Martin writes about the complicated lives of tv writers like David Chase, David Simon, Ed Burns, David Milch, and Alan Ball and the stories they all told through their shows. Needless to say, a lot of drama went into making all of their dramas. I really like reading about television. I also enjoy watching television, just not the television this book talks about. I haven’t seen The Sopranos, The Wire, Deadwood, or Breaking Bad. I don’t really plan on watching any of those shows, except maybe The Wire. I just don’t have the emotional space to watch all those dark, upsetting dramas. I don’t need to watch hours of those shows to know it would be too much for me. But reading about those shows and how they were created? That I can do: reading about these shows doesn’t have the same emotional weight and I learn so much about the creative process. Also, many of these shows have become such pop cultural touchstones that I want to have a rudimentary knowledge of their stories. Listening to Difficult Men was an excellent way to learn more. I have never read Catcher in the Rye, nor any other of the works of Salinger. 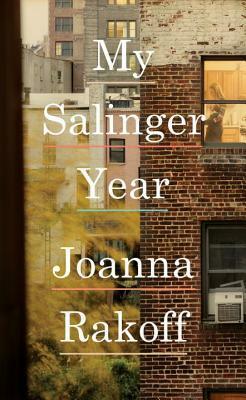 Nevertheless, My Salinger Year by Joanna Rakoff still caught my eye. I can’t resist a memoir devoted to a year in someone’s life (see my reading of: A Year of Biblical Womanhood, The Sharper Your Knife, the Less You Cry, My Year with Eleanor, Orange Is the New Black). There’s something about that sharp focus on one season of someone’s life that intrigues me. When Joanna Rakoff was 23 in the late 90’s, she took a job as an assistant at a New York literary agency: an agency that just happened to represent famous author J. D. Salinger. The agency resists the pull of the forthcoming 21st century, refusing to use computers or the internet and sticking to typewriters and Dictaphones. Throughout this year, Rakoff navigates the idiosyncrasies of her coworkers at the agency, as well as a relationship with an odd boyfriend. She also becomes responsible for answering Salinger’s fan mail, and her stories about these letters and her responses to them are fascinating. Publishing,writing, Salinger, life in New York City as a young woman. These are just a few of the topics I learned more about from reading My Salinger Year. This is why I read memoir, why I read anything, to learn about what I don’t already know. Who doesn’t love Goodnight Moon? I’m sure there must be some heartless readers who don’t enjoy this classic tale by Margaret Wise Brown, but I’m not sure I want to know those people. Goodnight Moon was one of my favorite books to read to my students–the kids loved to point out their favorite items in the room. 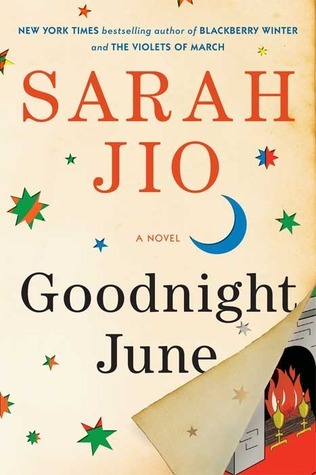 When I saw the book Goodnight June by Sarah Jio on the shelves at the library, I knew I had to try it out. Goodnight June is a novel that imagines a friendship between Goodnight Moon author Margaret Wise Brown and the aunt of the title character, June. June is an uptight business woman who has been ignoring her past and her family. She answers the call to go home, though, to settle her aunt Ruby’s estate, which includes Ruby’s bookstore, opened in the 1940s. June has to make the difficult decision of whether or not she can keep the store open. While she’s going through the store, though, she discovers letters written between her aunt Ruby and author Margaret Wise Brown. Her aunt has left her a scavenger hunt of sorts, asking June to find classic children’s books in the bookstore to find more of the correspondence between Ruby and Margaret. Through these letters, June learns the story of the friendship between her aunt and Margaret Wise Brown, as well as more about the origins of Brown’s Goodnight Moon. I don’t read a lot of adult fiction, because much of what I have read has been boring and predictable. Obviously I don’t pick that well because I know there has to be interesting and exciting adult fiction. Goodnight June is somewhere in the middle of that continuum–it wasn’t boring, but it was predictable. It was interesting, but not terribly exciting. Overall, though, it was a good story that made me want to read more by this author, even without the Goodnight Moon hook. The Divorce Papers made me realize how much I love epistolary novels. 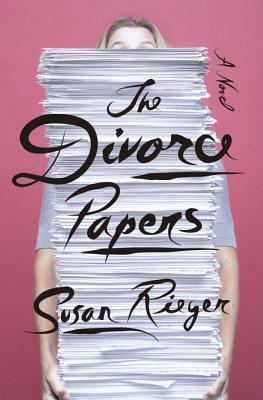 Susan Rieger’s story of how lawyer Sophie Diehl manages the divorce of Mia Meiklejohn Durkheim is told through correspondence, including legal papers, emails, newspaper articles, and more. Even though reading through paperwork might sound boring and divorce is an unpleasant topic, The Divorce Papers tells a fascinating story. Sophie is not a divorce lawyer. Yet somehow, a longtime client of her firm, Mia, decides that Sophie is the right lawyer for her divorce. Sophie’s firm wants to keep their client happy and asks her to take on this daunting task. As Sophie learns more about divorce law and of the story of her client, so do you. She asks for assistance from her bosses, reads articles about the law of her county, and keeps in close contact with her client. You learn more about both Sophie and Mia, as well as the intricacies of divorce law through each piece of correspondence. Normally when I choose a book, I check Goodreads for it’s average rating and I don’t often read books with a rating of less than 3.5 stars. I either didn’t check before I read The Divorce Papers or I decided I didn’t care, because it has a 3.32 rating. The masses are not always correct: sometimes a book just falls really well with you even when many others hated it. That was the case for me with The Divorce Papers. Once I picked it up, I couldn’t put it down. If you’re looking for good epistolary fiction, I recommend this book. I read #GIRLBOSS one morning in July when I woke up accidentally at 4:45 AM. My medication woke up my brain before my body wanted to get out of bed so I picked up #GIRLBOSS (yes, the hashtag is included in the title) off the top of the giant stack of books next to my bed. It’s not a long or difficult read, and I had the book finished by the time my alarm went off at 7 AM to get ready for work. Part memoir, part self-help, part business tale, #GIRLBOSS is Sophia Amoruso’s story of how she grew her business NastyGal. She started out as a one-woman shop on eBay selling vintage clothes she found in thrift stores and over the course of a few years grew that shop into a multi-million dollar company. I had never heard of either Amoruso or Nasty Gal, but the book had been recommended by a website I read for young professional women called Levo League. What I liked most about this book was, as is the case for most memoirs, is Sophia’s story. She’s honest and open about the mistakes she made in her young adulthood and as she started her business. Her journey to becoming the CEO of a giant brand was, to say the least, unconventional. She didn’t go to college, she didn’t attend business school. Instead, she built her business through trial and error and wasn’t afraid of making mistakes if she could learn from them. Interspersed through her personal story are tips for the modern young professional women, the #GIRLBOSS. She has rules like, “Money looks better in the bank than on your feet,” and “Dream big, start small.” None of these tips or rules are new or earth-shattering, but they are practical reminders that can help young women take charge of their personal and professional lives.